I’m writing this piece from two perspectives – as both an archaeologist (with a PhD on Roman villas in Britain); and as a former city councillor (I did a 13 year stretch) who served as a Cabinet Member for Environment and on the Planning Committee. I know from personal experience that the archaeological advice given to Planning Committee members can be of less than optimal quality. The ‘opportunity’ for Time-Teamesque digging is often presented as the archaeologist’s holy grail, as opposed archaeology’s real goal of legal protection and preservation. A Planning Officer saying, ‘We’ll consult with an archaeologist,’ is not a complete answer to a massive problem. A ‘watching brief’ or a rapid car-crash of a ‘rescue’ dig is still part of an unnecessary destruction, and Planning Committee members need to be aware of this prior to decision. Elected members rely hugely on the quality of the professional advice they receive, whether it’s about birds, trees or ancient strata – and there can be gaps in knowledge along the way, both about the history of a site and its significance, as well as some pretty starkly competing agendas. I hope that this piece helps to fill in a few of those gaps as painlessly as possible. Villas are farms. They're more than the stone or stone-footed houses in the middle. They're part of a landscape of working buildings, barns, outbuildings, paddocks, fields, ditches and boundaries. A generation’s worth of Roman archaeology in Britain has shown us a number of important things: that villa sites are very significant in terms of analysing the epic historical process of ‘romanisation’; and that the material expression through Roman-Empire-style material culture of Iron Age identities is written onto the landscape at villa sites; and that villas are always much, much bigger than the ‘corridor houses’ that tend to be the only bits excavated and Scheduled. I wrote my PhD thesis on Romano-British villas under the supervision of Dr David J Smith at Newcastle University. I was, like him, interested in the particular peculiarities of individual sites while looking for patterns in landscape uses, economic trends and social structures. I became intrigued with the social use of space on villas, with burials, and with the active use and deposition of ‘romanised’ material culture on what were, effectively, idealised representations of British working farms. 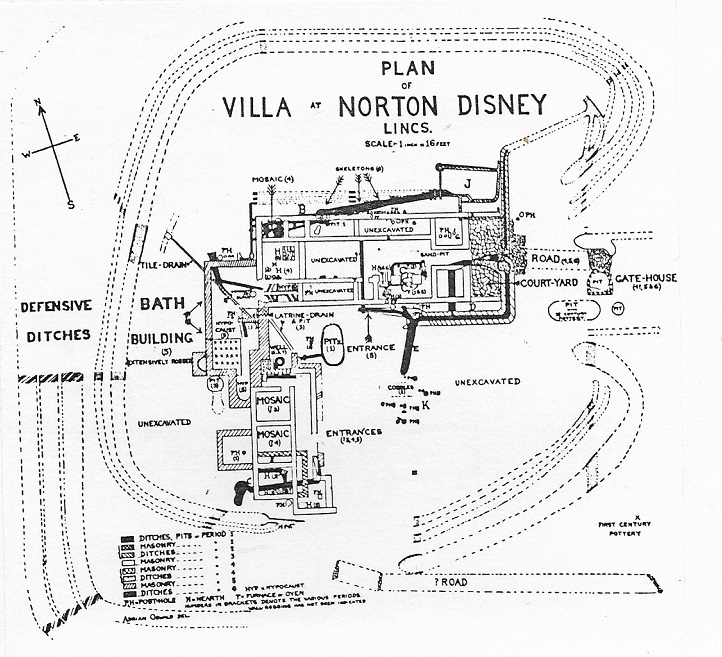 Norton Disney Roman villa was one of those outstandingly fascinating sites I looked at and wrote about, for all sorts of reasons – and it remains so. Indeed I’d argue that this site – the whole site, many acres of it, and not just the Scheduled area - is of national importance. Why is this site so important? 1 Was this really a ‘fortified villa’ – or rather is it one of the first manifestations of ‘private property’ in Britain? The excavator Oswald called it a fortified villa, because of the neat and extensive boundary ditches around the main corridor house. This now seems an extravagant claim - but the ditches are extremely significant. As the late Mark Gregson pointed out, the move from Iron Age-style timber farm buildings to stone houses in the Roman style signified more than a shift in fashion – this cultural change speaks to us of the arrival in Britain for the first time of the concept of private property. This is politically and historically significant to a degree that can’t be over-emphasised. 2 This site has huge environmental potential. The ‘fortification’ ditches may also have performed a drainage function given the geology of the site, and present the archaeologist with deposit that are waterlogged and preserved. An appropriate research programme of environmental analysis, in the future - properly costed and funded - would permit understanding the extent and uses of the villa as a working farm, including the uses of wood, leather, bone, textiles and other organic materials. But this does lead us back to remembering the overriding principle that all excavation is destructive – protection and preservation for future generations is preferable to smash-and-grab raids prior to development. This publication from Historic England shows the potential for recovery - and for loss. 3 There is crucial multi-period complexity here. Recently, a credible academic theory has started to emerge of Late Bronze Age tribal connectivity between Ireland and Lincolnshire, encompassing the Norton Disney site, and there is a rich Iron Age presence here as well as the complex and changing Roman period settlement activity through the centuries. 4. This site is vast in extent. The site straddles two counties – Lincs and Notts – and its intriguing earthworks and archaeological levels surround and underlie the areas proposed for development. Local archaeologists and historians are working hard to update Historic England (formerly English Heritage) and the county Historic Environment Records to bring knowledge and records up to date, including what happened on Oswald;s dig (and why) and where the finds and archives landed up; but it’s a race against time. There are good summaries on Richard Parker’s blog. 5 This site matters because of its intriguing burials and what they might say about end of Roman Britain. Part of my PhD was focused on expanding our understanding the dating and context of the burials in the ruins, and their relationship to the introduction of Christianity and/or social memory of significant houses. I have written a little about late burials on Romano-British villas sites in another blog piece on Beadlam villa. The Norton Disney ones in particular appear to be very carefully placed, very deliberate, and clearly respecting what would have been the visible ruins of a remembered or perhaps noteworthy house, at a time of great economic cultural change in the end years of ‘Roman Britain’. 6 The whole process of planning consent stops kidding councillors. As mentioned before, the nature of the Planning Process is brought into sharp focus by seeing this site’s future being determined. It’s crucial that this whole planning process stops telling elected members and other decision-makers that desk-top studies and rescue digs are a satisfactory substitute for preservation by actual preservation; or at the very least is telling them that this process properly requires from the outset a full-scale, state-of-the-art, time-appropriate, research excavation, survey and full publication – which of course, the developer can’t afford. And then the answer to that situation should be refusal. It has also become apparent as urgent research is being carried out in advance of the development threat in respect of our knowledge of this site – notably the previous excavation in the 1930s by Oswald, that all is not as it seems, mostly because the Oswald dig was not all as it should have been. 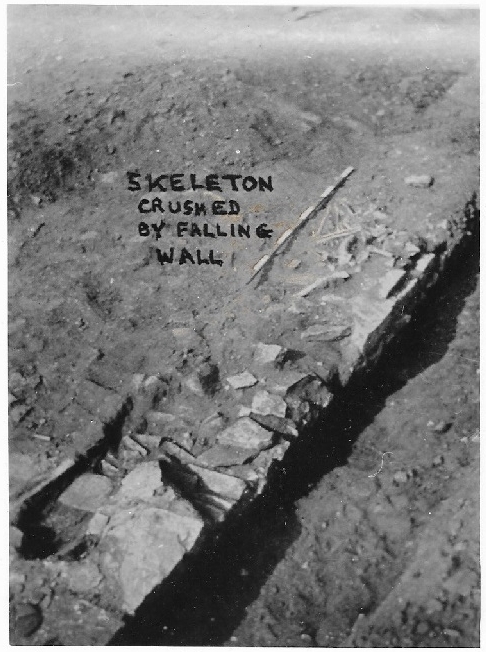 Norton Disney late burial (Oswald 1937 - 'skeleton crushed by falling wall' - caption hand-written on photo as published). Adrian Oswald like many other excavators told 'picture story' archaeology - where his site was a reflection of him, and the 'story' was a reflection of him, and it had to be fascinating, unique and current. But his techniques, conclusions and post-excavation practices might lead us to think that Norton Disney is a wonderful exemplar of a site where the earlier excavation itself needs to be re-excavated. This will take time, expertise and resources, in order to track down all the previous human bones, finds, associated records, notes, and archives – and to have these fully analysed and documented in an open access format. It should be a crucial early stage of research – and not an afterthought whilst the JCBs are circling. There is an immediate development threat to the site of Norton Disney Roman villa. Desk top evaluations, ‘preservation by record’ and watching briefs just won’t cut it. Contractor-led rapid rescue archaeology (usually leading to ‘grey literature’ ie unpublished records) won’t cut it either. The only legitimate solution is for the site to remain untouched and protected – effectively, for the Scheduled area to be extended – until such time that carefully controlled and appropriately-paced archaeological and environmental research can be carried out on this complex and nationally important site – which will be expensive and time-consuming. And the proposed development’s business case doesn’t even start to make the grade. Richard Parker’s Blog on Norton Disney Roman villa is a very good starting point, and it references previous works - notably Oswald A 1937 'A fortified villa at Norton Disney, Lincs' in Antiquaries Journal 17; I'd also recommend the blog post by Antony Lee; Mark Gregson's posthumously published paper in Young Archaeologist: collected unpublished papers (ed Keith W Ray); and the HER records for Lincs and Notts. My own published material on Romano-British villas includes A Gazetteer of Roman Villas in Britain and 'Romano-British villas and the social construction of space'. Burials, houses and aisled farmhouses are also discussed in my blog piece on Beadlam villa. Rena Macguire's 'Our Lovely Horse' is a great read. My thanks to: Ken Sadler; Richard Parker; Rena Maguire; and Ian Hodder for pointing me to work of the late Mark Gregson. I's also like to acknowledge the work of the late Dr David Smith of Newcastle University.